To anyone who managed an Ads account for an eCommerce business over the 2017 holiday season — Congrats! You did it, you survived. You made it through another crazy holiday season full of forecasting, budgeting, constantly changing promotions, and managing to desired KPIs. Hopefully, you used Ads business data to make your life a little easier, and if not, let me tell you how I managed to keep my accounts running and timely while still enjoying my break. Budgets are increased, consumer purchasing intent has peaked, and you need to juggle a slew of changing promotions over the course of a couple weeks. Ads Business Data is great way to upload and manage a data feed to be used in ads, extensions, or targeting. 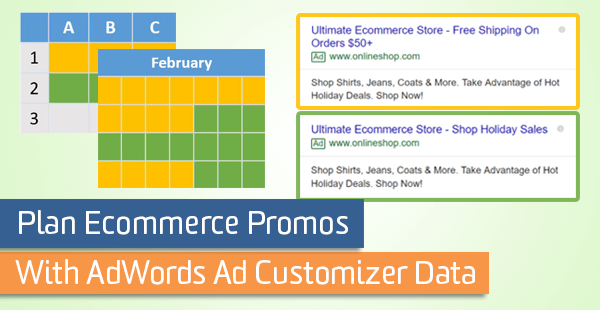 For the purpose of this article, I’ll walk through using Ad Customizer data to schedule and dynamically update Headline 2 of my search ads to mirror a site’s promotion calendar schedule. It’s not just holidays – any time you have messaging that is tied to a start and end date, you can use this feature to help save yourself time and make sure the right message is being shown. Even if your messaging isn’t strictly tied to a start and end date, you can still make us of Ads Business Data to quickly swap messaging in bulk for ad copy and ad extensions. First, I’ll take on building out your feed. Next, I’ll show you how to build your search ads to reference and pull data from the feed you build. You will be prompted to name your new feed. You’ll have to reference this file name in your ad copy, so keep the name short, simple and free of punctuation and spaces. You will also be prompted to upload a feed file—this is where the fun (scheduling) begins. Your feed is a simple spreadsheet comprised of 2 main element types: Attributes and Targeting. You’ll be adding attributes and targeting as column headers in your ad customizer sheet. It’s important to note that attributes come in 2 varieties: Standard Attributes and Custom Attributes. Custom attributes allow you to create any attribute you want (PromoMessage, Cost, InventoryCount, etc. ), but you must also define the attribute type (text, price, number or date) in your feed’s column headers in the following format: Attribute (attribute type). For example, to add a promotional message your column header would be: PromoMessage (text). Standard attributes already have pre-defined attribute types and do not require the attribute type in parentheses. Targeting is fairly straight-forward. 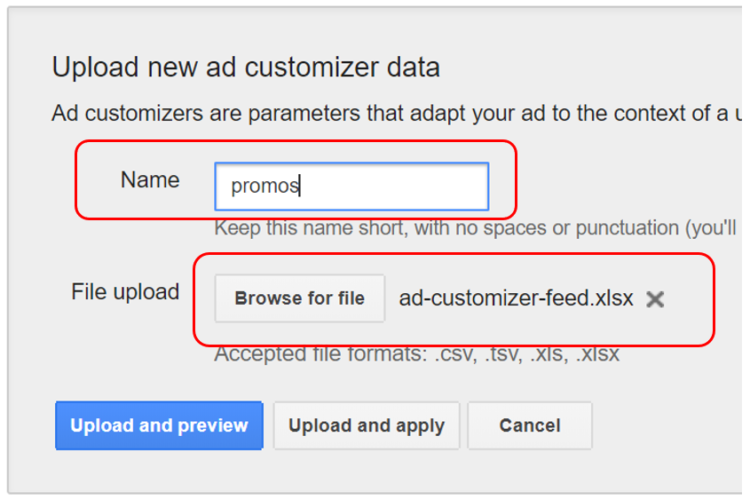 You can choose to have your ad customizer data inserted into ads account-wide, or you can specify certain campaigns, ad groups, keywords, or even geographic regions. Chose the targeting you desire and add it as a column header, or simply don’t include targeting column headers to serve account-wide. Take a look at the Ads ad customizer documentation for a full list of targeting and attribute syntax. When scheduling start and end dates for your message to run (a Standard Attribute), DO NOT specify an attribute type as (date). This will result in a Custom Attribute, used for adding a timestamp to the text of your ad, as opposed to creating start and end dates for serving. Remember from above, Standard Attributes already have pre-defined attribute types and do not require the attribute type in parentheses. I learned this one the hard way. Oops. In my case, I had a handful of different promos that would be running throughout the holiday season. All of which had different messaging and start and end dates and times, but would be running account-wide. After uploading your feed, the next step is to start building out your ads that will reference your ad customizer data feed. Now that you’ve built and successfully uploaded your ad customizer data feed, the final step is to build ads that reference it and pull in its content. Start building a new text ad, like normal. The only difference is that you will want to add a snippet of code in one of your headlines or description that references and pulls in content from your ad customizer feed. Your entire snippet of code might be longer than the acceptable character limit. That’s Ok. Just be sure that when the value actually gets pulled into your ad it results in a headline or description that adheres to standard character limits. The ability to use ad customizers to schedule promos in my ad copy certainly made my holiday promo season a little bit less hectic. I hope that you all can find a good situation to make use of ad customizers year round to enhance your workflow efficiency in the future as well. Anyone have any good promos planned for Valentine’s or President’s Day coming up? Think Business Data. If you found this guide useful and want to continue making strides in the ad copy department I’d encourage you to check out our ad copy testing guide and strategic ad copy tips, written by my fellow Lunametricians, Nick Eppinger and Michael Bartholow.